Sun and Stars Lightning Pass, allows one guest two visits within 48 hours. We suggest one by day and one by night! One Liberty Observation Deck is Philadelphia’s newest attraction. See Philly like never before from 57 stories above street level, providing amazing 360 degree views of the City of Brotherly Love and beyond. The views can only be described at "viewtiful"! 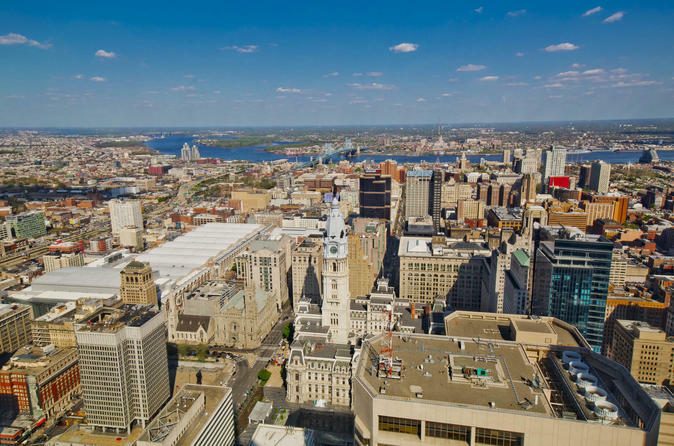 See "Philly From The Top" with once-in-a-lifetime views of the City of Brotherly Love. Located in the center of the city, it is within walking distance to other major attractions such as Love Park and Constitution Hall. One Liberty Observation Deck provides 360° views, 365 days a year, morning, noon and night from 57 stories high. The tallest observation deck in Philadelphia is "viewtiful"! Upon arrival, you can learn about the city’s proud history and place in Americana as well as have plenty of photo opportunities. Get a closer look at key landmarks with our six touch screen monitors placed throughout the observation Deck, where you can experience a high-definition look at noteworthy sites around the region. Available in English, Spanish, French, German & Mandarin.